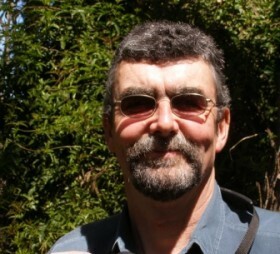 Now “semi-retired”, Barry is a graduate of zoology and a postgraduate of ecology. He has lectured at Ballarat University, Victoria, in wildlife management, wetland and terrestrial ecology, environmental philosophy and protected area management. It was Barry’s extensive knowledge, coupled with his long-held interest in Indigenous peoples’ understanding of the Australian landscape, which first prompted him to apply to volunteer with ICV. Barry’s most recent ICV assignment was on a demonstration farm, near the remote community of Wiluna, WA. Wiluna community farm is owned by a local Aboriginal family and its aim is to provide work readiness experience in horticulture for local indigenous students. The farm already has five active bee hives, bought so the bees would pollinate fruit and vegetable crops and provide a source of honey. But a lack of bee keeping experience among farm trainees led Barry to spend a week in Wiluna, providing valuable hands-on training. Barry helped farm trainees learn all aspects of basic bee keeping, from bee biology and hive hygiene to pest control assembling hives. As Barry awaits his next exciting assignment with ICV, he’s likely to be found in the great outdoors, bird watching, fly fishing and gardening. And, Barry tells us, he’d love to “spend more time painting and learning to play the blues” on his guitar, but admits his talents are limited. It’s hard to believe there are any limitations to what Barry can do - we’re just very fortunate to have his experience available to us here at ICV.